As I am typing this e-mail, I am all caught up on sewing. Halloween costumes are done. Wholesale orders are completed. Ahhhh, what a great feeling. Now I can concentrate on getting some stuff ready for the holidays or maybe just get in bed and finish reading my Real Simple magazine. On Saturday we decided to go to the zoo to participate in the Halloween festivities. 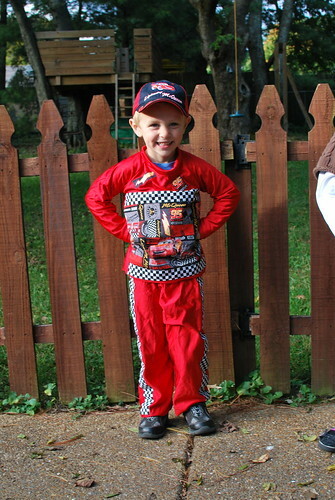 So in a sewing frenzy I threw together a Lightning McQueen costume for Miller. I was planning to just embellish a red t-shirt and sweat pants, but had no luck finding anything that would work. Mitch was digging around the attic trying to find things for Harper's costume when he found a big piece of red fabric that he used one year as a cape. It worked perfectly. I had a pattern for pjs. I used a size smaller and made it longer so that the outfit wouldn't be too baggy. I sewed the checkerboard fabric on the pants before I sewed them up. I also embellished the front of the shirt before I sewed it together. I really need to redo the collar it looks horrible in the back, but I am not sure I am going to worry about it. There was no sewing involved in Harper's costume. 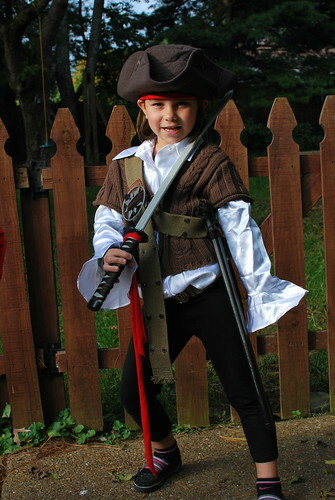 She wanted to be Elizabeth Swan from Pirates of the Caribbean. The hat, shirt, and vest where found at thrift stores. Mitch spotted the hat which is actually from a Pirates of the Caribbean costume. He is lucky like that. He put her outfit together while I was destroying the house and sewing Miller's costume. We just need to get her some boots and she will be good to go. I don't think I have ever had their costumes together this early. 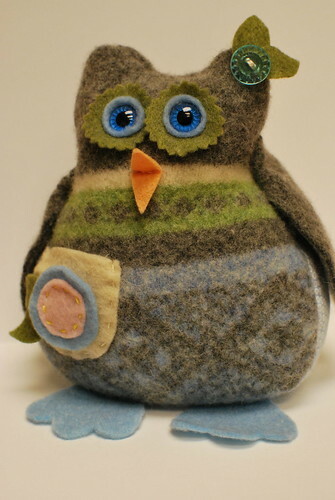 Because it wouldn't feel like Tuesday if I didn't share an owl photo, here's one I finished this week. I also finished up some coffee sleeves and gadget pouches for a wholesale order. Wow Jen, You did a great job. I always think that kids with crafty parents are so lucky (I think of you and Stacy in particular). I love Harper's little pose! So cute. And the owl is fantastic! I have some old sweaters in the dryer right now trying to felt them! I think I am going to attempt a little kitty for Addie for Christmas. I'll have to do it all on the sly and at night, so I figure I better start right now. But I have a really soft gray sweater for the body and some stripey ones for the arms/legs/tail! I'm excited...I can't wait to see if it turns out like it looks in my head! Then again, the Halloween costumes are still in a stack in the corner. It must be an amazing feeling to be all caught up. Those costumes are great!!! Violet is going to be a Monarch Butterfly this year, all store-bought, thanks to a special gift from her Mimi and Grandpa. Hopefully I'll be making her costumes after this year though. I'm on the waiting list for a sewing class :) It's just for an afternoon and they teach you a few basic skills, kind of like "intro to sewing". My husband said that if I really liked it then I can enroll in a longer class. Now, if my name will just get to the top of that list! Wow, that must feel fantastic to be all caught up! You go, Jen! The costumes came together so well. Nice Captain Swan finds at the thrift stores too. She looks great! what a great couple of costumes! i still haven't even begun to think of Halloween costumes for my kiddos - guess I need to get a movin'! I've been trying to figure out how to making a Lightning McQueen outfit for Canyon. I just kept nodding when he TOLD ME over and over again that he wanted to dress up as Lightning. I decided to do a race care driver outfit, but still haven't put anything together. I'm going to see what I can come up between now and next week using your idea. Thanks, because I've got three outfits to put together.